Jobs in Kanpur For Freshers: This is urgent jobs opening for fresher who lives in Kanpur & Uttarakhand District. The Post Name Territory Sales In charge urgently required in Ghari Detergent Office before 1 Month of Time Interval. Kanpur is a city of Factory where Industry is running to boost jobs & economy of India. 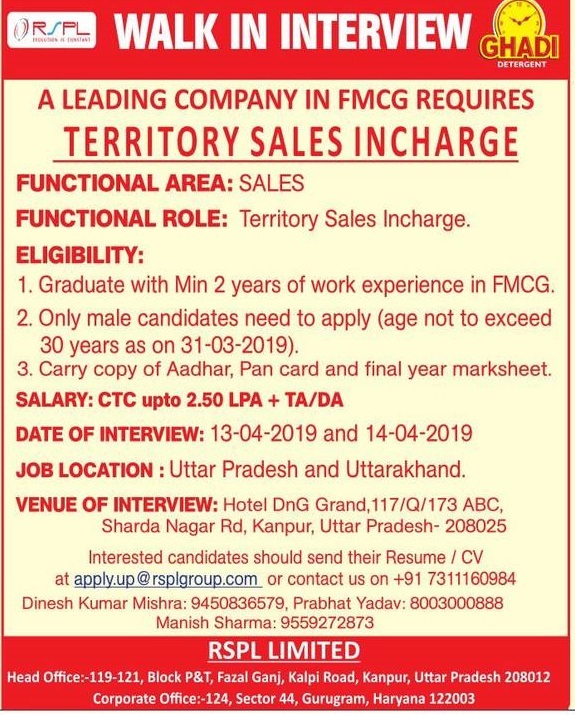 Document required getting Jobs in Kanpur or any private company: You must always carry copy of adhaar card, pan card and final year certificate. Walkin Interview Jobs in Kanpur: Hotel DNG Grand, 117/Q/173 ABC, Sharda Nagar Rd, Kanpur, Uttar Pradesh-208025. How to apply: Interested candidates should send their resumes/CV at apply.up@rsplgroup.com or contact us at phone number mention official advertisement. 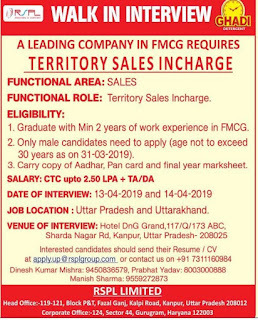 RSPL Limited Recruitment 2019: Ghadi Detergent Head Office in Kanpur & Haryana issued jobs from their zonal management staff.